Graphic novels aren't my forte, but my two oldest boys love them. Most of the graphic novels they read are geared toward younger audiences, most notably Pokemon and Dragon Ball Z Kai. But they've started wanting to look at some of the graphic novels for older teens and I've been concerned at some of the language, violence, and the portrayals of female characters. So when this showed up in my goodreads feed because a friend was reading it, I thought I'd check it out. 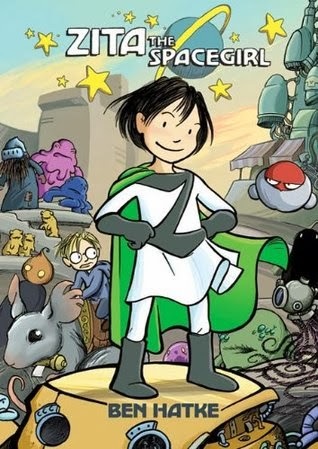 Definitely geared toward the younger set, Zita the Spacegirl and its sequel Legends of Zita the Spacegirl are an entertaining read. In the first installment, the titular character and her friend Joseph discover a meteoroid in a crater. Joseph wants to report it to the authorities, and definitely not to push the big red button on the device they found. Zita teases Joseph and then defiantly pushes the button. A dimensional portal opens, and coiled tentacles reach through and grab Joseph just as the portal disappears. A horrified Zita runs away and hides in the woods, only to bravely return to the site, push the button again, and step into the unknown to rescue her friend. Along the way, she meets aliens, robots, and other odd creatures and creates her signature look. Oh, and saves the world from certain destruction. In Legends of Zita the Spacegirl, Zita has become a celebrity. She's still trying to find her way back to earth while on her grand autograph-signing tour, when she runs into a shape-shifting robot that impersonates her and takes her place, leaving her stranded on a planet. Again, she manages to restore herself to her rightful place and save (another) world from destruction. Zita is brave, resourceful, creative, and friendly, and is defined by her own actions rather than her appearance or her relationship to others. I thought the first book had a better story crafted than the second, but perhaps when I've had a chance to read the third, it will flow together better for me. All in all, a fun diversion for an afternoon, and my boys liked them, too.